2 - 2 - countries. 1 We propose to direct the applicants to file all subsidiary and/or subsequent agreement(s) with the Department for prior approval and to resubmit for renewal their various alliance agreement(s) in five years. We also tentatively find it in the public interest to direct CAI to report full-itinerary Origin-Destination Survey of Airline Passenger Traffic (O&D Survey) data for all passengers to and from the United States (similar to the O&D data already reported by American). By this order, we are providing the Joint Applicants and other interested parties the opportunity to comment on our tentative findings. We tentatively find that, subject to the conditions and limitations specified, our action in this matter will advance important public benefits. Approval would permit the two airlines to operate more efficiently and to provide better service to the U.S. traveling and shipping public, and would allow American to compete more effectively with other carriers and alliances in U.S.-Canada transborder markets. With our proposed limitation of approval and immunity to these transborder markets, our proposed action will be consistent with our policy of facilitating competition among emerging multinational airline networks, where those networks will lead to lower costs and enhanced service for U.S. and international consumers. We fully recognize that the trend toward expanding international airline networks and our action here will allow our airlines to become significant players in the globalization of the airline industry. Our proposed action in this order, as limited to U.S.-Canada transborder markets, is consistent with our approval and grant of antitrust immunity for the alliance between Northwest Airlines and KLM, 2 and with our recent grant of immunity for the proposed alliance between United Air Lines and Lufthansa. 3 Our experience with the Northwest/KLM alliance has demonstrated that such alliances between U.S. and foreign airlines can benefit consumers. The alliance between Northwest and KLM has enabled the two airlines to operate more efficiently and to provide integrated service in many more markets than either partner could serve individually. 4 We expect that the alliance between American and CAI will also provide substantial benefits to consumers. I. Background A. The U.S.-Canada Aviation Agreement On February 24, 1995, the Governments of the United States and Canada signed a new Air Transport Agreement Between the Government of Canada and the Government of the United States. The new accord allows any Canadian carrier to serve any point in the United States, effective immediately. 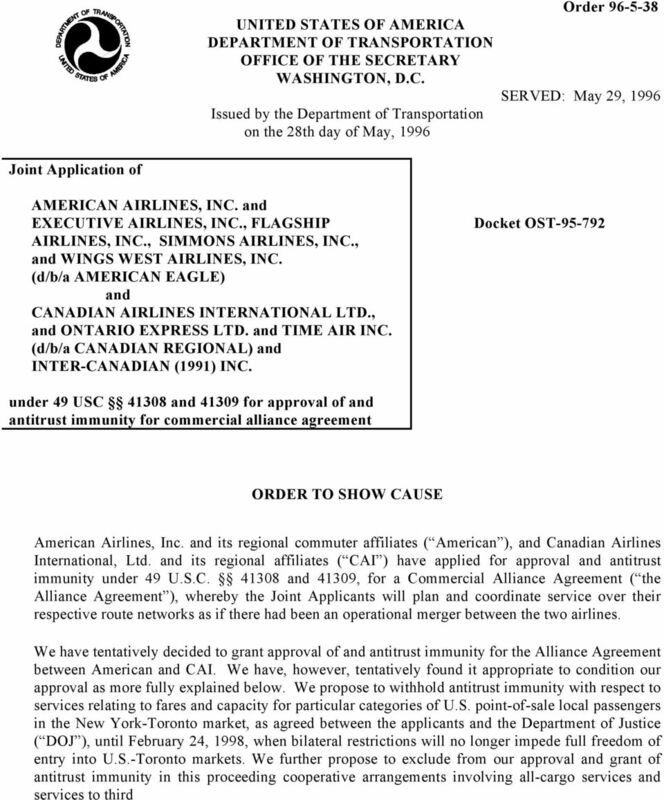 It also allows U.S. carriers to serve any point in Canada except (in the short 1 The predicate for our tentative approval and grant of antitrust immunity for the American-CAI alliance is the existence of a bilateral aviation agreement between the United States and Canada that provides for open transborder (i.e., third- and fourth-freedom) markets, subject to a short-term phase-in period. To the extent that the U.S.-Canada market remains restricted beyond the phase-in period provided for in the U.S.-Canada agreement, we are unprepared to grant antitrust immunity. However, this Department would consider lifting these restrictions on grant of antitrust immunity if and when the underlying market restrictions are removed. 2 Orders and Order , May 20, International Aviation: Airline Alliances Produce Benefits, but Effect on Competition is Uncertain (GAO/RCED , April 6, 1995); and A Study of International Airline Code Sharing, Gellman Research Associates, Inc., December 1994. 3 - 3 - term) Montreal, Toronto, and Vancouver, effective immediately. It does provide soon, however, for open entry by U.S. carriers into the three restricted Canadian cities, to be phased in over two years (at Montreal and Vancouver) and three years (at Toronto). At Vancouver and Montreal, during each of the first two years from the date of the agreement, the U.S. is able to designate six additional carriers, with each carrier able to operate up to two daily round-trip frequencies. At Toronto, during each of the first two years from the date of the agreement, the U.S. is able to select up to two additional carriers, with each carrier able to operate up to two daily round-trip frequencies. For the third year, the U.S. is able to select up to four more carriers, each with up to two daily round-trip frequencies. 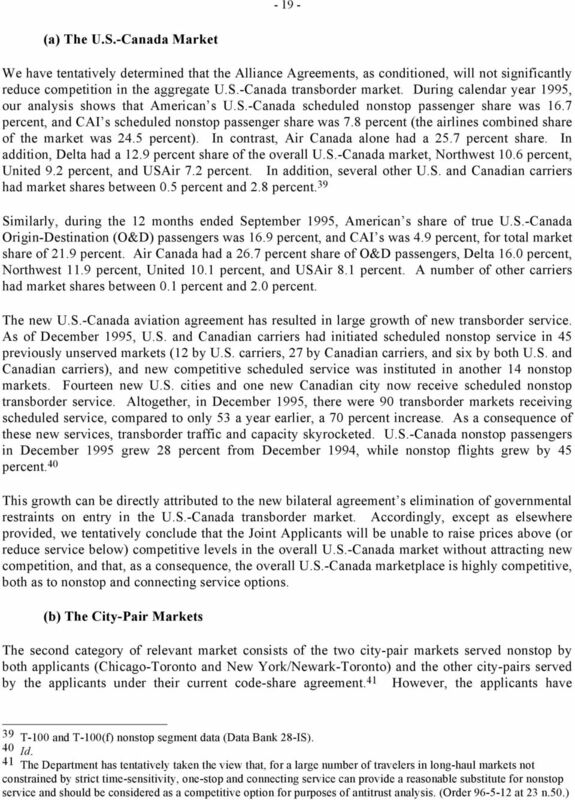 U.S. carriers will gain open entry at Montreal and Vancouver effective February 24, 1997, and at Toronto effective February 24, The agreement also places frequency limits on code-sharing operations between the United States and Montreal, Vancouver, and Toronto. These limitations also expire February 24, 1997, at Montreal and Vancouver, and February 24, 1998, at Toronto. The purpose of the new U.S.-Canada agreement is to create an open transborder aviation environment between the U.S. and Canada. U.S. carrier entry is temporarily restricted at the three largest Canadian gateways to give the national carriers of Canada time to adjust to the new competitive environment. As the earlier U.S.-Netherlands Agreement has demonstrated, open transborder operations should encourage more competitive service in U.S.-Canada transborder markets. Since the price and service quality of U.S.-Canada transborder airline service will be disciplined by market forces, not restrictive bilateral agreements, U.S.-Canada travelers will have multiple price and service options in choosing airline services available on transborder routes between the United States and Canada. B. The Joint Applicants Operational and Ownership Relationships American and CAI began coordinating parts of their operations before the signing of the new air services agreement. In 1994, American s parent corporation AMR acquired a one-third equity interest in CAI in return for a cash investment of $182 million (US). In addition, AMR provides the following services under contract to CAI, and under CAI s managerial control: pricing and yield management, operations planning, international base operations, food and beverage support, reservations, ground operations, capacity planning, technical and data processing services, and accounting services. The contract provides for payment by CAI to AMR of $2 billion over 20 years. The applicants offer competing nonstop services with their own aircraft in the following two markets: Chicago (O Hare)-Toronto: Operated 6 times daily by American and 2 times daily by CAI. New York (La Guardia)-Toronto: Operated 7 times daily by American and 5 times daily by CAI. 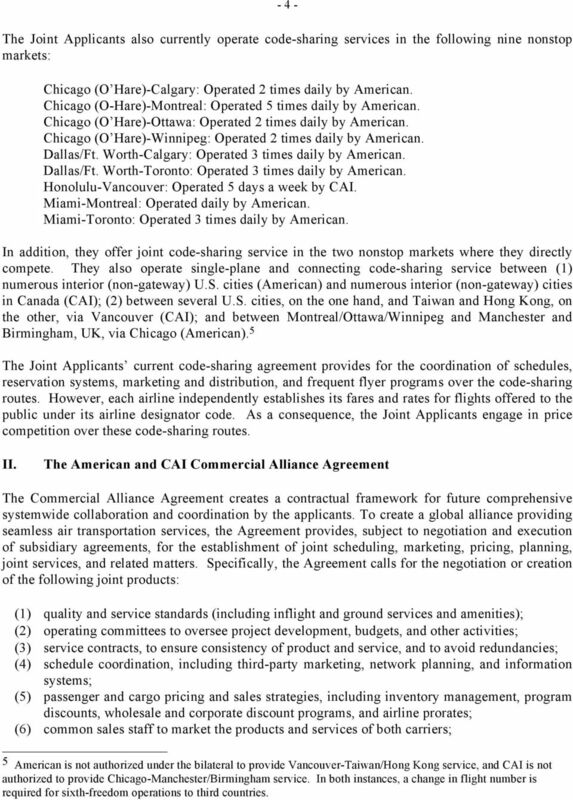 4 - 4 - The Joint Applicants also currently operate code-sharing services in the following nine nonstop markets: Chicago (O Hare)-Calgary: Operated 2 times daily by American. Chicago (O-Hare)-Montreal: Operated 5 times daily by American. Chicago (O Hare)-Ottawa: Operated 2 times daily by American. Chicago (O Hare)-Winnipeg: Operated 2 times daily by American. Dallas/Ft. Worth-Calgary: Operated 3 times daily by American. Dallas/Ft. Worth-Toronto: Operated 3 times daily by American. Honolulu-Vancouver: Operated 5 days a week by CAI. Miami-Montreal: Operated daily by American. Miami-Toronto: Operated 3 times daily by American. In addition, they offer joint code-sharing service in the two nonstop markets where they directly compete. They also operate single-plane and connecting code-sharing service between (1) numerous interior (non-gateway) U.S. cities (American) and numerous interior (non-gateway) cities in Canada (CAI); (2) between several U.S. cities, on the one hand, and Taiwan and Hong Kong, on the other, via Vancouver (CAI); and between Montreal/Ottawa/Winnipeg and Manchester and Birmingham, UK, via Chicago (American). 5 The Joint Applicants current code-sharing agreement provides for the coordination of schedules, reservation systems, marketing and distribution, and frequent flyer programs over the code-sharing routes. However, each airline independently establishes its fares and rates for flights offered to the public under its airline designator code. As a consequence, the Joint Applicants engage in price competition over these code-sharing routes. II. The American and CAI Commercial Alliance Agreement The Commercial Alliance Agreement creates a contractual framework for future comprehensive systemwide collaboration and coordination by the applicants. To create a global alliance providing seamless air transportation services, the Agreement provides, subject to negotiation and execution of subsidiary agreements, for the establishment of joint scheduling, marketing, pricing, planning, joint services, and related matters. Specifically, the Agreement calls for the negotiation or creation of the following joint products: (1) quality and service standards (including inflight and ground services and amenities); (2) operating committees to oversee project development, budgets, and other activities; (3) service contracts, to ensure consistency of product and service, and to avoid redundancies; (4) schedule coordination, including third-party marketing, network planning, and information systems; (5) passenger and cargo pricing and sales strategies, including inventory management, program discounts, wholesale and corporate discount programs, and airline prorates; (6) common sales staff to market the products and services of both carriers; 5 American is not authorized under the bilateral to provide Vancouver-Taiwan/Hong Kong service, and CAI is not authorized to provide Chicago-Manchester/Birmingham service. In both instances, a change in flight number is required for sixth-freedom operations to third countries. 5 - 5 - (7) commission programs, including agency, group, corporate, and override commissions; (8) travel agent contracts; (9) advertising and media programs; (10) ancillary programs, including travel packages, facilities coordination, information systems, and mail service; (11) coordinated frequent flyer programs; (12) revenue allocation agreements and procedures; (13) common marketing and accounting information; and (14) creation of a joint identity through jointly developed logos, symbols, or names. In short, the Alliance Agreement, if approved, will allow the two airlines effectively to operate much as a single firm, while retaining their individual identities regarding national ownership and control. III. The Application and Responsive Pleadings A. The Joint Applicants Request 6 On November 3, 1995, American and CAI filed a request seeking approval of and antitrust immunity for the Commercial Alliance Agreement, for a five-year term. In addition, the Joint Applicants also request antitrust immunity for the coordination of the presentation and sale of the carriers airline service in their computer reservation systems (CRS) and the operations of their respective internal reservations systems. 7 The Joint Applicants state that, through their Alliance Agreement, they intend to broaden and deepen their cooperation in order to improve the efficiency of their coordinated services, expand the benefits available to the traveling and shipping public, and enhance their ability to compete in the global marketplace. Although the Joint Applicants state that they will continue to be independent companies, they claim that the objective of the Alliance Agreement is to enable the airlines to plan and coordinate service over their respective route networks as if there had been an operational merger between the two companies. The applicants assert that approval of and antitrust immunity for the Alliance Agreement is supported by substantial public and commercial benefits and efficiencies and by U.S. international aviation policy. They state that the alliance will create network synergies by (1) linking the U.S. and Canadian hubs of the alliance partners; (2) producing cost efficiencies and savings through integration and coordination that can be passed on to consumers in the form of lower fares and improved service (including increased frequencies); and (3) increasing competition in the U.S.- Canada and the global marketplaces. Conversely, they argue that denial of their requests will 6 By Order , issued January 11, 1996, we found that the record of this case was substantially complete, and established further procedural deadlines. We also deferred action on the Joint Applicants motions for confidential treatment of certain data and documents (these motions were filed by American on February 29 and CAI on March 11, 1996), while limiting access to the information to counsel and outside experts who represent interested parties in this case. 7 American is the principal owner of SABRE, and CAI participates in SABRE. In addition, American s parent corporation, AMR, operates CAI s internal reservations system under contract to CAI. 6 - 6 - prevent consummation of the Alliance Agreement and thereby deny the benefits to the public. The Joint Applicants state that they cannot carry out the complete integration contemplated by the... Agreement in the absence of antitrust immunity because of the substantial risk... [of] costly and lengthy antitrust litigation.... This very real threat of a challenge would chill the alliance and reduce its benefits to the traveling and shipping public. 8 Therefore, the airlines regard antitrust immunity as an essential condition precedent to implementation of the Alliance Agreement. 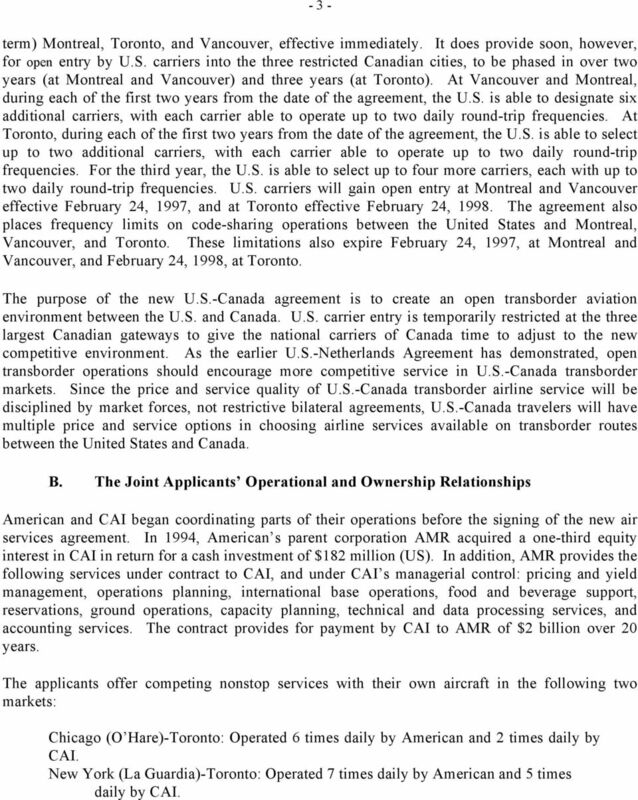 The applicants maintain that neither carrier can attain these public interest benefits, either individually, due to existing bilateral barriers and financial constraints, or through merger, because U.S. and Canadian laws concerning nationality and ownership effectively preclude mergers between U.S. and Canadian airlines. 9 Therefore, in the absence of a merger, the joint venture planned by the Alliance Agreement requires that the applicants craft business understandings that will expose them to the risk that their coordinated activities would be challenged on antitrust grounds. The Joint Applicants state that the Alliance Agreement will permit them to compete more effectively against competing global alliances. They further maintain that the Alliance Agreement will allow them to develop mechanisms to enhance efficiencies, reduce costs and provide better service to the traveling and shipping public by providing for: increased frequencies and enhanced on-line services; expanded access to beyond and behind gateway markets; coordinated hubs and U.S.-Canada segment operations; expansion of discount fares; enhanced availability of discount seats on transborder flights; improved seat inventory control; and reduced sales, marketing and reservations costs. The Joint Applicants also maintain that the grant of antitrust immunity will advance U.S. international aviation policy objectives by accelerating liberalization of the global marketplace, thus achieving an important goal of the Department s Open Skies initiative. Further, the applicants assert that the Alliance Agreement is fully consistent with the Department s policy of encouraging and facilitating the globalization and cross-networking of air transportation. They maintain that approval of the proposed Alliance Agreement, coupled with antitrust immunity, will foster real economic and competitive pressures in the marketplace that will accelerate reform and transform international aviation policy. 10 The applicants hold the view that their request is warranted by foreign policy considerations, fully consistent with U.S. international aviation policy, and an envisioned outcome of the new aviation arrangement between Canada and the United States. American and CAI contend that denial of the request for antitrust immunity might well discourage other foreign governments from negotiating Open Skies accords with the United States. 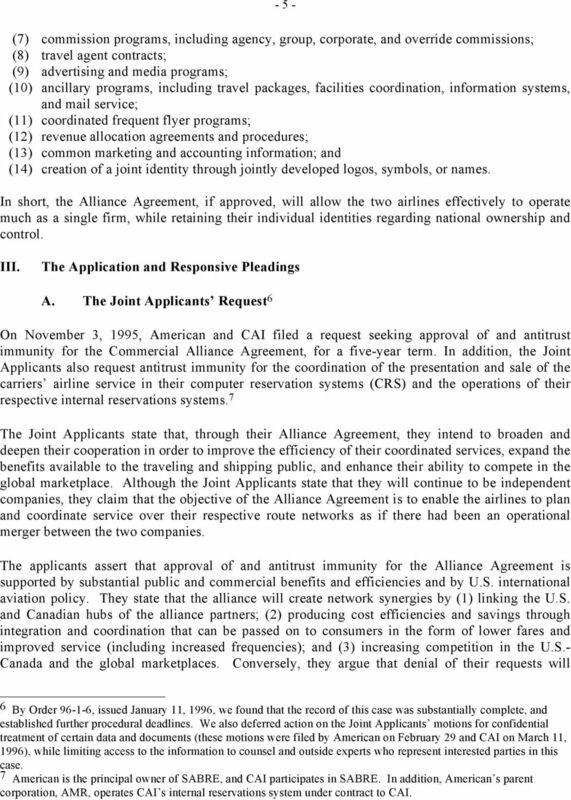 The applicants assert that denial of their request for 8 Joint Application, at The Joint Applicants maintain that if U.S. and Canadian law permitted the two airlines to merge, their merger would comply with U.S. antitrust law. Since, the applicants assert, the proposed business relationship would essentially be an end-to-end market extension merger, it would have a nominal impact on horizontal competition. (Joint Application at 9.) 10 Joint Application, at 7-8. 7 - 7 - antitrust immunity would be inconsistent with the U.S. Government s commitment to open-entry markets and free and fair international competition and to what they contend is the Department s assurance of comparable opportunities in exchange for open skies. They also claim that denial of immunity would be contrary to the spirit of the North America Free Trade Agreement, the liberalized aviation agreement with Canada, and the expectations of the Canadian Government The Joint Applicants assert that the Alliance Agreement will not substantially reduce or eliminate competition between the United States and Canada. Indeed, they argue that a fully implemented Alliance Agreement will enable American and CAI to increase their competitiveness against Air Canada, the largest U.S.-Canada carrier, and against Air Canada s U.S. code-sharing partners, Continental and United. They also claim that the proposed alliance will have substantially less effect on competition in the overall U.S.-Canada market than did the Northwest/KLM alliance on the U.S.-Netherlands market. Similarly, American and CAI maintain that the alliance will not substantially reduce or eliminate competition in any single city-pair market. The applicants compete head-to-head in only two nonstop markets, Chicago-Toronto and New York-Toronto. In the Chicago-Toronto market, United, the largest hubbing carrier at Chicago, will continue to provide daily competitive service, while, in the New York/Newark-Toronto market, Air Canada, the largest U.S.-Canada carrier, will remain the dominant carrier in the market. As a consequence, the applicants argue that the competitive effects of the alliance will be even smaller than those the Department found with respect to the U.S.-Netherlands market when it approved the Northwest and KLM joint venture, where there was no third-carrier nonstop competition in the Minneapolis/St. Paul-Amsterdam and Detroit-Amsterdam markets. Further, the applicants claim that the liberalized aviation agreement between the U.S. and Canada will assure competitive discipline by providing for open entry and pricing and service freedom. They also maintain that almost all significant transborder city-pair routes--including the two nonstop routes where they compete with their own aircraft--are or can be served by multiple U.S. and/or Canadian airlines on either a nonstop, single-plane, or one-stop online connecting basis. 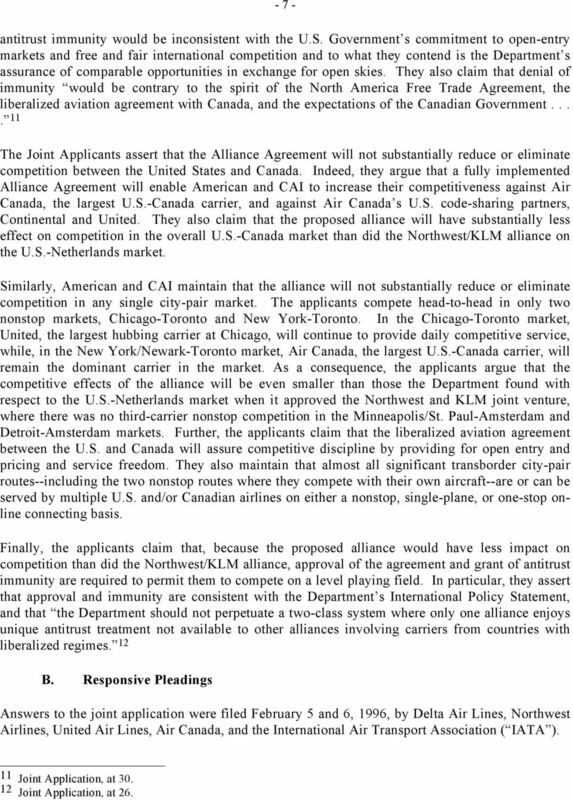 Finally, the applicants claim that, because the proposed alliance would have less impact on competition than did the Northwest/KLM alliance, approval of the agreement and grant of antitrust immunity are required to permit them to compete on a level playing field. In particular, they assert that approval and immunity are consistent with the Department s International Policy Statement, and that the Department should not perpetuate a two-class system where only one alliance enjoys unique antitrust treatment not available to other alliances involving carriers from countries with liberalized regimes. 12 B. Responsive Pleadings Answers to the joint application were filed February 5 and 6, 1996, by Delta Air Lines, Northwest Airlines, United Air Lines, Air Canada, and the International Air Transport Association ( IATA ). 11 Joint Application, at Joint Application, at 26. 8 - 8 - Delta argued that the Department should either defer or dismiss the application for consideration at such time as the transitional restrictions under the U.S.-Canada bilateral expire. 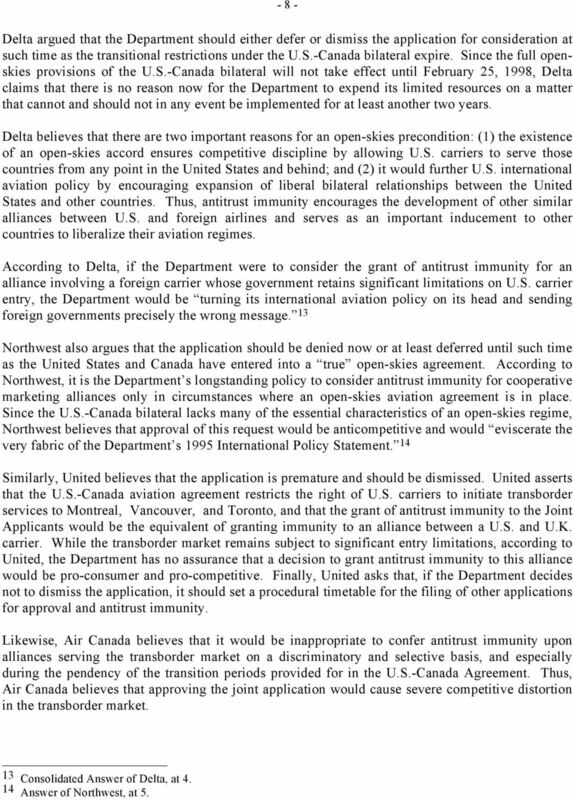 Since the full openskies provisions of the U.S.-Canada bilateral will not take effect until February 25, 1998, Delta claims that there is no reason now for the Department to expend its limited resources on a matter that cannot and should not in any event be implemented for at least another two years. Delta believes that there are two important reasons for an open-skies precondition: (1) the existence of an open-skies accord ensures competitive discipline by allowing U.S. carriers to serve those countries from any point in the United States and behind; and (2) it would further U.S. international aviation policy by encouraging expansion of liberal bilateral relationships between the United States and other countries. Thus, antitrust immunity encourages the development of other similar alliances between U.S. and foreign airlines and serves as an important inducement to other countries to liberalize their aviation regimes. According to Delta, if the Department were to consider the grant of antitrust immunity for an alliance involving a foreign carrier whose government retains significant limitations on U.S. carrier entry, the Department would be turning its international aviation policy on its head and sending foreign governments precisely the wrong message. 13 Northwest also argues that the application should be denied now or at least deferred until such time as the United States and Canada have entered into a true open-skies agreement. According to Northwest, it is the Department s longstanding policy to consider antitrust immunity for cooperative marketing alliances only in circumstances where an open-skies aviation agreement is in place. Since the U.S.-Canada bilateral lacks many of the essential characteristics of an open-skies regime, Northwest believes that approval of this request would be anticompetitive and would eviscerate the very fabric of the Department s 1995 International Policy Statement. 14 Similarly, United believes that the application is premature and should be dismissed. 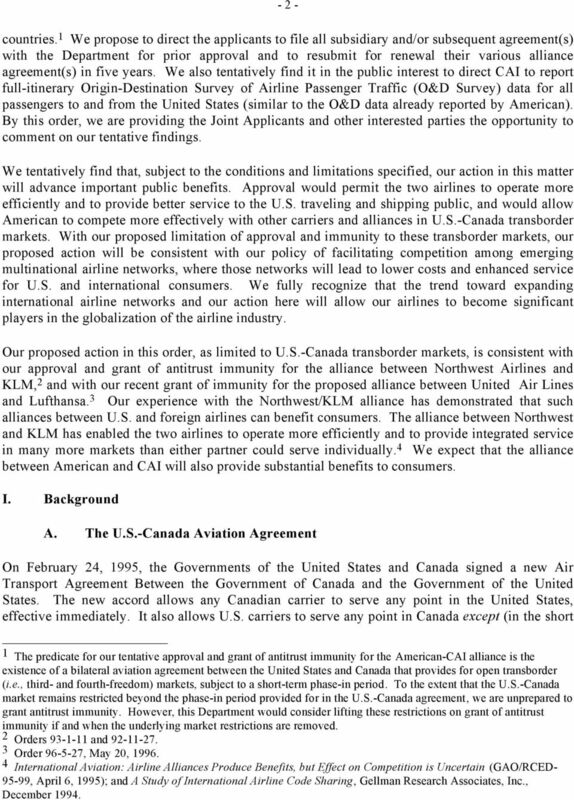 United asserts that the U.S.-Canada aviation agreement restricts the right of U.S. carriers to initiate transborder services to Montreal, Vancouver, and Toronto, and that the grant of antitrust immunity to the Joint Applicants would be the equivalent of granting immunity to an alliance between a U.S. and U.K. carrier. While the transborder market remains subject to significant entry limitations, according to United, the Department has no assurance that a decision to grant antitrust immunity to this alliance would be pro-consumer and pro-competitive. Finally, United asks that, if the Department decides not to dismiss the application, it should set a procedural timetable for the filing of other applications for approval and antitrust immunity. 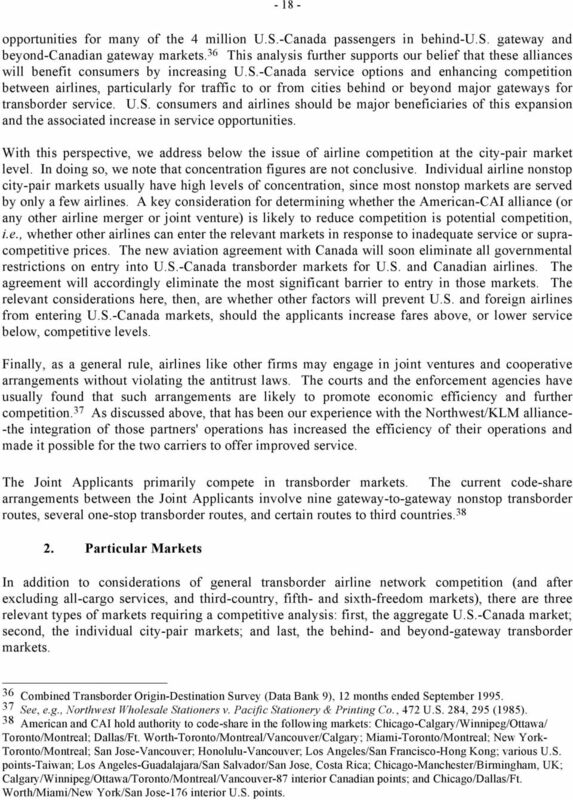 Likewise, Air Canada believes that it would be inappropriate to confer antitrust immunity upon alliances serving the transborder market on a discriminatory and selective basis, and especially during the pendency of the transition periods provided for in the U.S.-Canada Agreement. Thus, Air Canada believes that approving the joint application would cause severe competitive distortion in the transborder market. 13 Consolidated Answer of Delta, at Answer of Northwest, at 5. 10 achieves the goal of open skies in a fixed period is just as deserving of the benefits of immunity as an immediate open-skies agreement, so long as the other tests for immunity are met. 15 Finally, the applicants claim that the issues raised by IATA are not relevant in this proceeding. 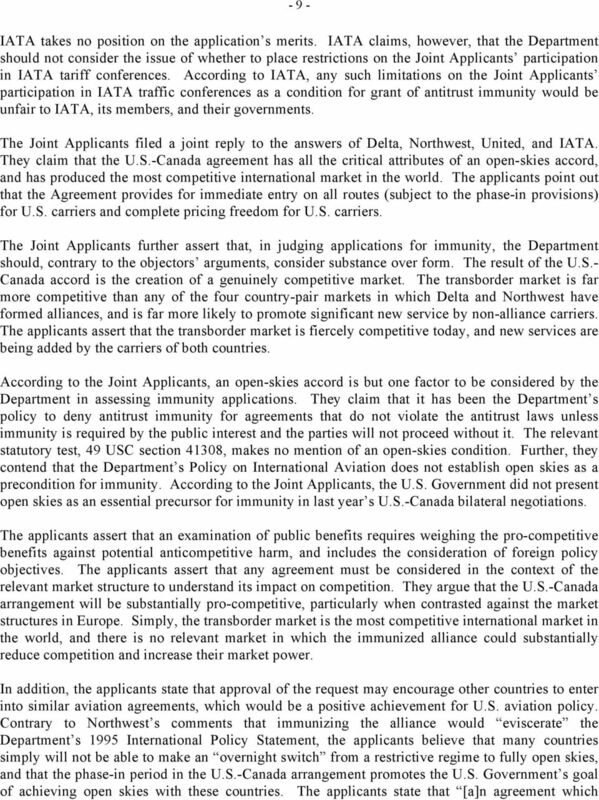 The applicants state that U.S.-Canada markets have never been included in IATA tariff coordination activities. Moreover, American withdrew from the IATA passenger tariff coordinating conference in Therefore, the Department s actions in this case will have no impact on IATA activities with respect to the transborder market. IV. Tentative Decision We tentatively find that the Alliance Agreement should be approved and granted antitrust immunity under sections and 41309, to the extent provided below. We have also tentatively decided to grant the Joint Applicants request for antitrust immunity to coordinate their CRS and internal reservations system. CAI has no ownership interest in any CRS. Unlike the foreign airline partners in certain previous alliances, CAI has no ownership interest in a CRS competing with American s SABRE CRS. Accordingly, we find there is no need to impose conditions or otherwise limit immunity with respect to the applicants CRS operations. Our examination of the Joint Applicants proposal tentatively leads us to find that the integration of the two carriers services will enhance competition overall and allow the airlines to provide better service and enable them to operate more efficiently. We find that it is unlikely that the Alliance Agreement, subject to the conditions agreed upon by the applicants and the Department of Justice (DOJ), will substantially reduce competition in any market. 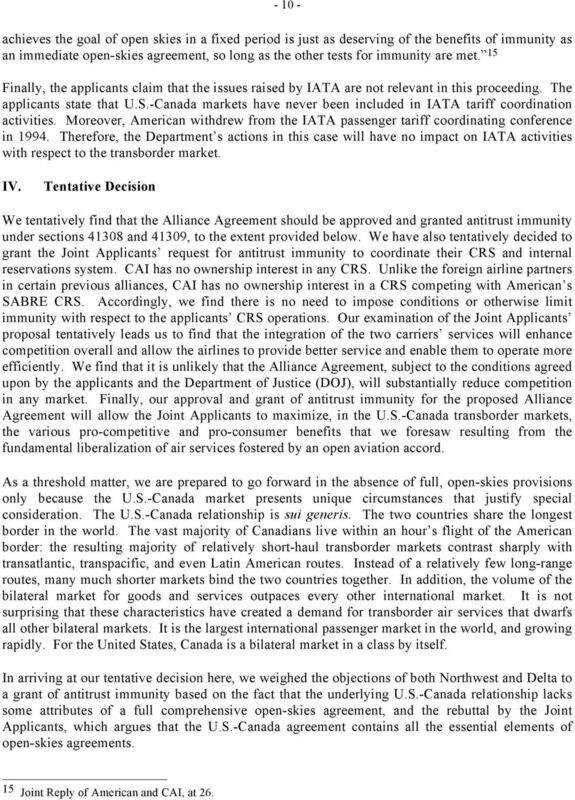 Finally, our approval and grant of antitrust immunity for the proposed Alliance Agreement will allow the Joint Applicants to maximize, in the U.S.-Canada transborder markets, the various pro-competitive and pro-consumer benefits that we foresaw resulting from the fundamental liberalization of air services fostered by an open aviation accord. As a threshold matter, we are prepared to go forward in the absence of full, open-skies provisions only because the U.S.-Canada market presents unique circumstances that justify special consideration. The U.S.-Canada relationship is sui generis. The two countries share the longest border in the world. The vast majority of Canadians live within an hour s flight of the American border: the resulting majority of relatively short-haul transborder markets contrast sharply with transatlantic, transpacific, and even Latin American routes. Instead of a relatively few long-range routes, many much shorter markets bind the two countries together. In addition, the volume of the bilateral market for goods and services outpaces every other international market. It is not surprising that these characteristics have created a demand for transborder air services that dwarfs all other bilateral markets. It is the largest international passenger market in the world, and growing rapidly. For the United States, Canada is a bilateral market in a class by itself. In arriving at our tentative decision here, we weighed the objections of both Northwest and Delta to a grant of antitrust immunity based on the fact that the underlying U.S.-Canada relationship lacks some attributes of a full comprehensive open-skies agreement, and the rebuttal by the Joint Applicants, which argues that the U.S.-Canada agreement contains all the essential elements of open-skies agreements. 15 Joint Reply of American and CAI, at 26. 11 While we agree with the arguments of both Northwest and Delta as a matter of principle, we view this application as a unique exception to that principle, given the very distinct character of the U.S.- Canada market. The U.S.-Canada transborder market supports more U.S. gateways, nonstop citypairs, diverse airlines, and competitive routings and service options than any other international market. Perhaps most important, at the conclusion of the brief phase-in of entry and capacity at Montreal, Toronto, and Vancouver, the underlying air transport agreement between the United States and Canada will have created an open environment for transborder passenger and belly cargo services and prices. Against this background, we tentatively find that the U.S.-Canada aviation relationship justifies positive action on the application before us, to the extent described below. 16 We note that DOJ has raised concerns about the potential loss of competition in some particular aspects of the New York-Toronto market. The applicants have agreed to conditions designed to address DOJ s concerns in this respect--i.e., the applicants have agreed to exclude coordination of specified activities relating to certain types of fares and capacity for U.S. point-of-sale local passengers flying nonstop between New York and Toronto. We will adopt these conditions, which are set forth in Appendix A. In addition, we have tentatively decided to withhold approval and immunity from third-country markets and from all-cargo service. The U.S.-Canada aviation agreement does not provide for unrestricted all-cargo services, and does not permit unrestricted services or provide for operational flexibility in third-country markets. While we do not find, in the unique U.S.-Canada context, that these deficiencies compel a negative finding on the application as a whole, we will not grant to these alliance partners immunity for cooperative activity in areas where the underlying bilateral agreement does not provide soon for open entry and operational flexibility. We will also require the applicants (1) to file all subsidiary and subsequent agreement(s) with the Department for prior approval; 17 and (2) to resubmit for renewal their various alliance agreement(s) in five years. We also find it in the public interest to direct CAI to report full-itinerary O&D Survey data for all passenger itineraries that contain a United States point (similar to the O&D data already reported by American). 18 V. Decisional Standards under 49 U.S.C. Sections and A. Section Under 49 U.S.C. section 41308, the Department has the discretion to exempt a person affected by an agreement under section from the operation of the antitrust laws to the extent necessary to allow the person to proceed with the transaction, provided that the Department determines that 16 No other bilateral market resembles the U.S.-Canada market and, accordingly, we intend to continue to insist upon full open-skies agreements as a prerequisite to our consideration of applications for antitrust immunity. 17 Regarding this requirement, we do not expect the alliance partners to provide the Department with the minor technical understandings that are necessary to blend fully their day-to-day operations but that have no additional substantive significance. We do, however, expect and direct the joint applicants to provide the Department with any contractual instruments that may materially alter, modify, or amend the Commercial Alliance Agreement. 18 We intend to use this data exclusively for purposes of monitoring the alliance. Accordingly, we will keep CAI s O&D data confidential. We will not release data for CAI to any other carrier. Correspondingly, CAI will not gain access to O&D data for any other carrier. 12 the exemption is required by the public interest. Generally, the Department withholds antitrust immunity from agreements that do not substantially reduce or eliminate competition, 19 unless there is a strong showing on the record that antitrust immunity is required by the public interest, and that the parties will not proceed with the transaction absent the antitrust immunity. 20 B. Section Under 49 U.S.C. section 41309, the Department must determine, among other things, that an intercarrier agreement is not adverse to the public interest and not in violation of the statute before granting approval. 21 The Department may not approve an intercarrier agreement that substantially reduces or eliminates competition unless the agreement is necessary to meet a serious transportation need or to achieve important public benefits that cannot be met, and those benefits cannot be achieved, by reasonably available alternatives that are materially less anticompetitive. 22 The public benefits include international comity and foreign policy considerations. 23 The party opposing the agreement or request has the burden of proving that it substantially reduces or eliminates competition and that less anticompetitive alternatives are available. 24 On the other hand, the party defending the agreement or request has the burden of proving the transportation need or public benefits. 25 VI. Tentative Approval of the Agreement A. Excluded Services It is the Department s policy not to approve and grant antitrust immunity to international intercarrier cooperation agreements in markets that lack freedom of operation. 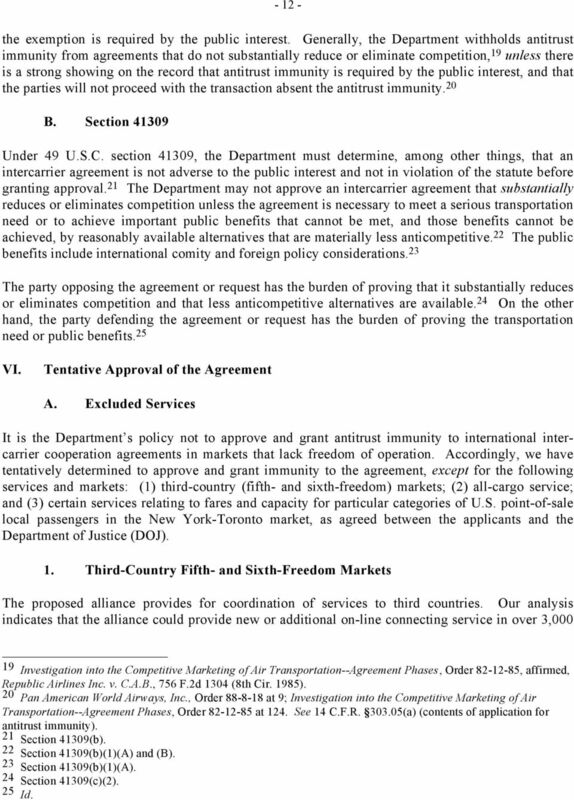 Accordingly, we have tentatively determined to approve and grant immunity to the agreement, except for the following services and markets: (1) third-country (fifth- and sixth-freedom) markets; (2) all-cargo service; and (3) certain services relating to fares and capacity for particular categories of U.S. point-of-sale local passengers in the New York-Toronto market, as agreed between the applicants and the Department of Justice (DOJ). 1. Third-Country Fifth- and Sixth-Freedom Markets The proposed alliance provides for coordination of services to third countries. Our analysis indicates that the alliance could provide new or additional on-line connecting service in over 3, Investigation into the Competitive Marketing of Air Transportation--Agreement Phases, Order , affirmed, Republic Airlines Inc. v. C.A.B., 756 F.2d 1304 (8th Cir. 1985). 20 Pan American World Airways, Inc., Order at 9; Investigation into the Competitive Marketing of Air Transportation--Agreement Phases, Order at 124. See 14 C.F.R (a) (contents of application for antitrust immunity). 21 Section 41309(b). 22 Section 41309(b)(1)(A) and (B). 23 Section 41309(b)(1)(A). 24 Section 41309(c)(2). 25 Id. 13 city-pair markets from 168 U.S. cities to 20 cities beyond Canada. These markets accounted for 10.7 million O&D passengers during the 12 months ended September Notwithstanding the large potential traffic flows in the third-country markets, we tentatively conclude that we should deny approval and antitrust immunity to third-country markets, inasmuch as these markets are not open to code-sharing by competing carriers. Except for the U.S., the Canadian government s aviation agreements with other countries generally provide for only limited entry. Moreover, the U.S.-Canada aviation agreement does not provide for third-country codesharing operations or for fifth-freedom rights. Even sixth-freedom operations are subject to a mandatory change of flight number at the homeland gateway. As a consequence, other U.S. carriers and alliances--either in partnership with other Canadian carriers or with third-country carriers--will have little opportunity to compete with the proposed alliance in these markets. In view of the foregoing, we tentatively conclude that the restrictions applicable to third country markets are not consistent with our policy of granting antitrust immunity only in open competitive markets. Accordingly we have tentatively determined to deny approval and to withhold antitrust immunity from the alliance in third-country markets. 27 However, were Canada to agree to amend the U.S.-Canada aviation agreement to grant mutual fifthfreedom and third-country code-sharing rights, we would favorably consider extending immunity to third-country markets. 2. All-Cargo Services The Joint Applicants also propose to coordinate and integrate their cargo service, including scheduling, pricing, and marketing. 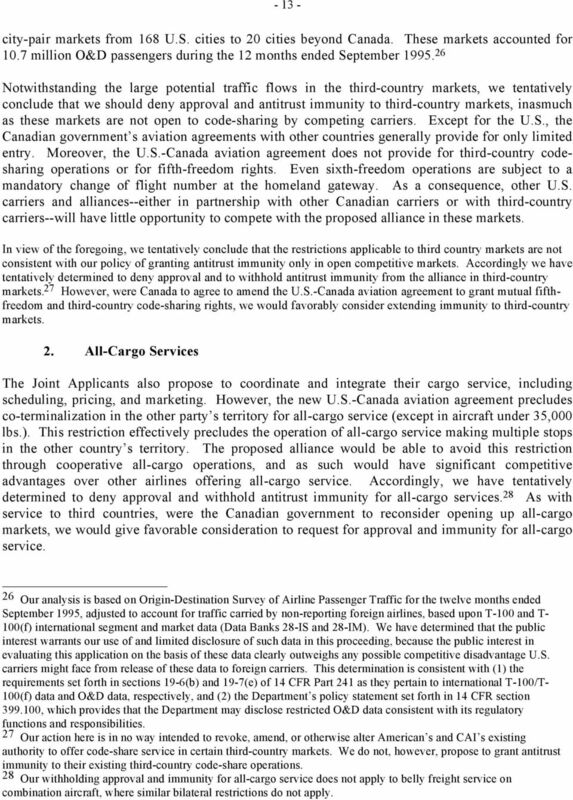 However, the new U.S.-Canada aviation agreement precludes co-terminalization in the other party s territory for all-cargo service (except in aircraft under 35,000 lbs.). This restriction effectively precludes the operation of all-cargo service making multiple stops in the other country s territory. The proposed alliance would be able to avoid this restriction through cooperative all-cargo operations, and as such would have significant competitive advantages over other airlines offering all-cargo service. Accordingly, we have tentatively determined to deny approval and withhold antitrust immunity for all-cargo services. 28 As with service to third countries, were the Canadian government to reconsider opening up all-cargo markets, we would give favorable consideration to request for approval and immunity for all-cargo service. 26 Our analysis is based on Origin-Destination Survey of Airline Passenger Traffic for the twelve months ended September 1995, adjusted to account for traffic carried by non-reporting foreign airlines, based upon T-100 and T- 100(f) international segment and market data (Data Banks 28-IS and 28-IM). We have determined that the public interest warrants our use of and limited disclosure of such data in this proceeding, because the public interest in evaluating this application on the basis of these data clearly outweighs any possible competitive disadvantage U.S. carriers might face from release of these data to foreign carriers. This determination is consistent with (1) the requirements set forth in sections 19-6(b) and 19-7(e) of 14 CFR Part 241 as they pertain to international T-100/T- 100(f) data and O&D data, respectively, and (2) the Department s policy statement set forth in 14 CFR section , which provides that the Department may disclose restricted O&D data consistent with its regulatory functions and responsibilities. 27 Our action here is in no way intended to revoke, amend, or otherwise alter American s and CAI s existing authority to offer code-share service in certain third-country markets. We do not, however, propose to grant antitrust immunity to their existing third-country code-share operations. 28 Our withholding approval and immunity for all-cargo service does not apply to belly freight service on combination aircraft, where similar bilateral restrictions do not apply. 14 3. The New York-Toronto Market The application by American and CAI for antitrust immunity requires us to examine the alliance's potential impact on competition in all relevant markets. On such antitrust issues, we initially confer with DOJ, given its experience in the enforcement of the antitrust laws. However, we have the ultimate authority to determine whether the application meets the statutory prerequisites for the grant of antitrust immunity. DOJ has examined the likely competitive impact of the proposed alliance between American and CAI. 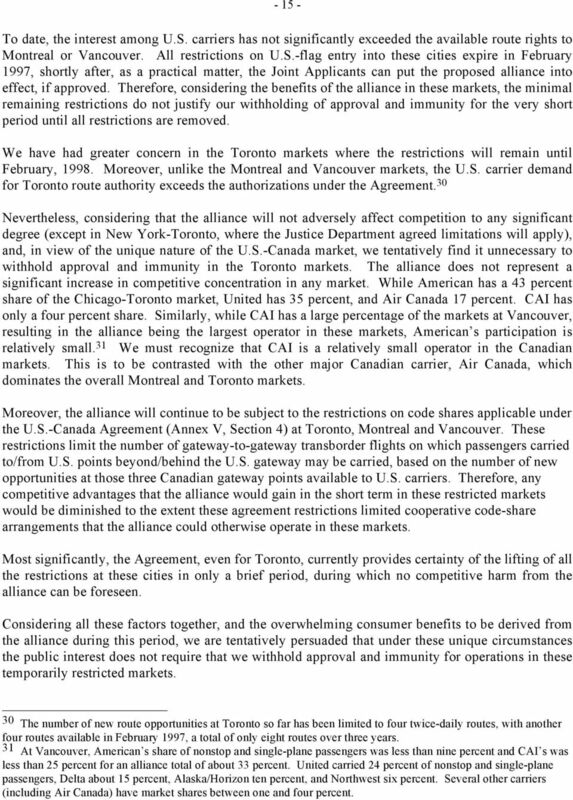 DOJ identified one nonstop market--new York-Toronto--where it was concerned that competition could be reduced if American and CAI were authorized to agree on fares and capacity for local traffic. After discussions between the DOJ and the applicants, they have agreed to limit the scope of their requested immunity so as to exclude certain activities relating to particular fares and capacity for U.S. point-of-sale local passengers on the New York-Toronto route. The conditions agreed upon by DOJ and the applicants are attached as Appendix A to this order. In brief, the agreement would exclude from the grant of immunity the following activities: pricing, inventory, or yield management coordination, or pooling of revenues, with respect to local U.S. point-of-sale passengers flying nonstop between New York and Toronto, with certain exceptions. This agreement also provides for expiry of the limitations on the New York-Toronto market on February 25, 1998, upon the conclusion of the phase-in period at Toronto, unless DOJ notifies the parties that material changes in economic conditions warrant a review of such limitations. The applicants have agreed to these limitations on the requested immunity after conferring with the DOJ, and we tentatively intend to include the agreed conditions in our proposed grant of antitrust immunity. The antitrust analysis that follows, therefore, reflects the exclusion from immunity of local traffic in the New York-Toronto market, to the extent set out in Appendix A. We have carefully considered whether we should withhold our approval and grant of antitrust immunity for all alliance services to Montreal, Vancouver and Toronto, where short-term restrictions remain under the Agreement. We have tentatively concluded that despite our policy not to grant antitrust immunity in markets where there are restrictions on entry or flexibility of operations, the unique situation arising from the U.S.-Canada Agreement, as recited above, and the limited nature of the continuing restrictions, balanced against the very significant consumer competitive advantages that will arise from this alliance, justifies our grant of approval and immunity in these markets, notwithstanding the restrictions temporarily in effect. First, we note that, with the exception of all-cargo services and third-country operations, the U.S.- Canada agreement currently provides for open transborder operations in all markets, with only a short transition period for these three markets alone. In the Montreal and Vancouver markets, the agreement gave U.S. carriers a total of six new Montreal and six new Vancouver route opportunities, with up to two daily frequencies, in each of the two year phase-in period for these points, for a total of 24 new daily round trips at each city Montreal and Vancouver are still subject to the maximum of two daily flights per new designation, and a maximum of four daily flights per newly designated U.S. carrier in each market. 15 To date, the interest among U.S. carriers has not significantly exceeded the available route rights to Montreal or Vancouver. All restrictions on U.S.-flag entry into these cities expire in February 1997, shortly after, as a practical matter, the Joint Applicants can put the proposed alliance into effect, if approved. Therefore, considering the benefits of the alliance in these markets, the minimal remaining restrictions do not justify our withholding of approval and immunity for the very short period until all restrictions are removed. We have had greater concern in the Toronto markets where the restrictions will remain until February, Moreover, unlike the Montreal and Vancouver markets, the U.S. carrier demand for Toronto route authority exceeds the authorizations under the Agreement. 30 Nevertheless, considering that the alliance will not adversely affect competition to any significant degree (except in New York-Toronto, where the Justice Department agreed limitations will apply), and, in view of the unique nature of the U.S.-Canada market, we tentatively find it unnecessary to withhold approval and immunity in the Toronto markets. The alliance does not represent a significant increase in competitive concentration in any market. While American has a 43 percent share of the Chicago-Toronto market, United has 35 percent, and Air Canada 17 percent. CAI has only a four percent share. Similarly, while CAI has a large percentage of the markets at Vancouver, resulting in the alliance being the largest operator in these markets, American s participation is relatively small. 31 We must recognize that CAI is a relatively small operator in the Canadian markets. This is to be contrasted with the other major Canadian carrier, Air Canada, which dominates the overall Montreal and Toronto markets. Moreover, the alliance will continue to be subject to the restrictions on code shares applicable under the U.S.-Canada Agreement (Annex V, Section 4) at Toronto, Montreal and Vancouver. These restrictions limit the number of gateway-to-gateway transborder flights on which passengers carried to/from U.S. points beyond/behind the U.S. gateway may be carried, based on the number of new opportunities at those three Canadian gateway points available to U.S. carriers. Therefore, any competitive advantages that the alliance would gain in the short term in these restricted markets would be diminished to the extent these agreement restrictions limited cooperative code-share arrangements that the alliance could otherwise operate in these markets. Most significantly, the Agreement, even for Toronto, currently provides certainty of the lifting of all the restrictions at these cities in only a brief period, during which no competitive harm from the alliance can be foreseen. Considering all these factors together, and the overwhelming consumer benefits to be derived from the alliance during this period, we are tentatively persuaded that under these unique circumstances the public interest does not require that we withhold approval and immunity for operations in these temporarily restricted markets. 30 The number of new route opportunities at Toronto so far has been limited to four twice-daily routes, with another four routes available in February 1997, a total of only eight routes over three years. 31 At Vancouver, American s share of nonstop and single-plane passengers was less than nine percent and CAI s was less than 25 percent for an alliance total of about 33 percent. United carried 24 percent of nonstop and single-plane passengers, Delta about 15 percent, Alaska/Horizon ten percent, and Northwest six percent. Several other carriers (including Air Canada) have market shares between one and four percent. 16 To reiterate, our tentative decision to afford antitrust immunity, prior to the complete de jure opening of the Toronto market, is based on a determination that delaying the effectiveness of immunity would serve no significant public interest purpose. First, we anticipate that the four new U.S. carrier designations made available in February 1997 will satisfy most U.S. carrier requests to serve that market, and that, except with respect to the New York-Toronto market, the market will effectively be open during the interim period before de jure open skies. Second, we rely on the fact that under the U.S.-Canada bilateral, an open transborder aviation environment will become effective automatically, without any further action by any government entity in February, Absent this near-term satisfaction of entry needs and the certainty of complete entry liberalization in so short a period, we would not grant immunity for the U.S.-Toronto routes. 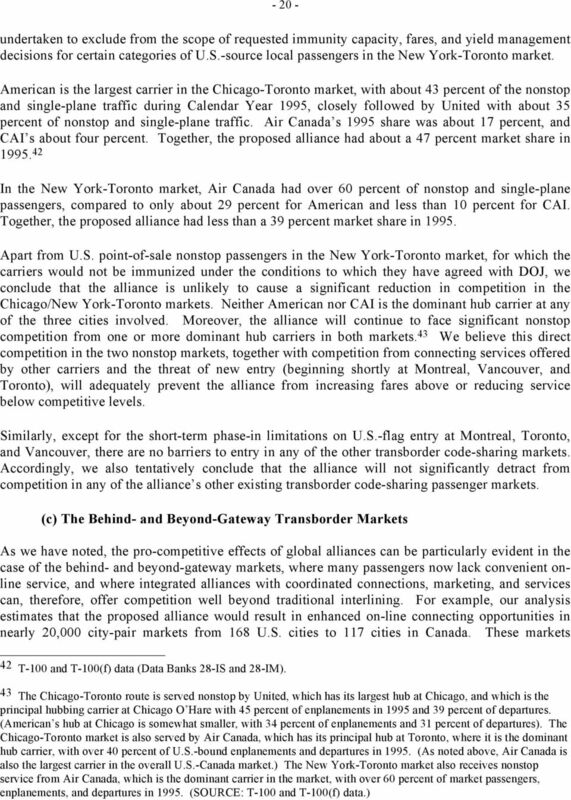 Moreover, we note that Air Canada has a 41.2 percent market share of transborder passengers at Toronto. 32 We would not want to harm competition by artificially delaying the competitive entry of a strong alliance. These factors are relevant to our decision to accelerate the grant of antitrust immunity in this case and not to allow by inaction a result that is less competitive. 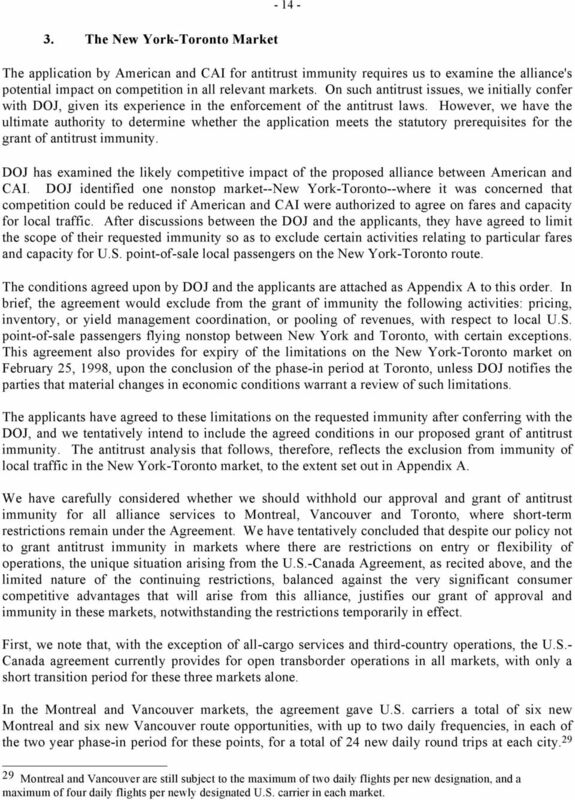 We emphasize that our tentative decision to afford immunity for the non-new York-Toronto routes should in no way be interpreted to suggest any relaxation of our policy regarding antitrust immunity. Rather, our decision is premised on the uniqueness of the Canadian case, not only for the reasons noted above, but also because of Canada s unique geographic relationship with the United States, and the vast and various networks of land transportation alternatives available between the U.S. and Canada, a competition force absent in transoceanic markets. Absent all of these factors, the Department would not be favorably disposed to providing immunity to the U.S.- Toronto routes prior to February, We are aware of no present or potential situation in Europe or elsewhere that presents the many extraordinary factors in the Canadian case, and on which we rely here, to afford a grant of immunity during a short-term phase-in period. Our policy remains to consider the grant of antitrust immunity only where the market(s) at issue are currently specified to be fully open to new entry and operations -- both de jure (by reason of bilateral agreements) and de facto. Only in such markets can we be assured that immunity will be pro-competitive and pro-consumer, the touchstones of our immunity approach. Moreover, it must be clearly understood that the existence of an open skies relationship in no way guarantees any grant of immunity. To the contrary, it is entirely possible that immunity will not be found to be procompetitive or pro-consumer in particular cases notwithstanding a fully open national market, depending on such factors as relevant market concentration, potential future barriers, overall dominance and size of the applicants, and the like. In short, an open skies agreement, even where it is also a de facto open entry market, is a necessary, but not automatically sufficient, basis for the grant of antitrust immunity. B. 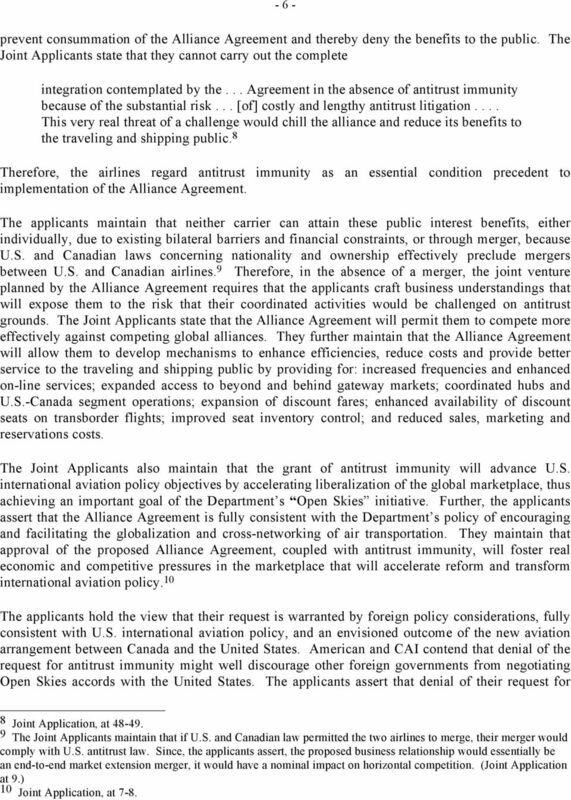 Antitrust Issues The Joint Applicants state that through the Alliance Agreement they intend to broaden and deepen their cooperation in order to improve efficiency, expand various benefits available to the traveling and shipping public, and enhance their ability to compete in the global marketplace. They state that, while retaining their separate corporate and national identities, they fully intend to cooperate to the extent necessary to create a seamless air transport system. Accordingly, the Alliance 32 Combined Transborder Origin-Destination Survey (Data Bank 9), 12 months ended September 1995. 17 Agreement s intended commercial and business effects are equivalent to a merger of the two airlines. In determining whether the proposed transaction would violate the antitrust laws, we will apply the standard Clayton Act test used in examining whether mergers will substantially reduce competition in any relevant market. 33 The Clayton Act test requires the Department to consider whether the Agreement will substantially reduce competition by eliminating actual or potential competition between American and CAI so that they would be able to effect supra-competitive pricing or reduce service below competitive levels. 34 To determine whether a merger or comparable transaction is likely to violate the Clayton Act, the Department of Justice (DOJ) and the Federal Trade Commission (FTC) use their published merger guidelines. 35 The Merger Guidelines' general approach is that transactions should be blocked if they are likely to create or enhance market power, market power being defined as the ability profitably to maintain prices above competitive levels for a significant period of time (firms with market power can also harm customers by reducing product and service quality below competitive levels). To determine whether a proposed merger is likely to create or enhance market power, the Department of Justice and the FTC primarily consider whether the merger would significantly increase concentration in the relevant markets, whether the merger raises concern about potential competitive effects in light of concentration in the market and other factors, and whether entry into the market would be timely, likely, and sufficient either to deter or to counteract the merger's potential for harm. 1. 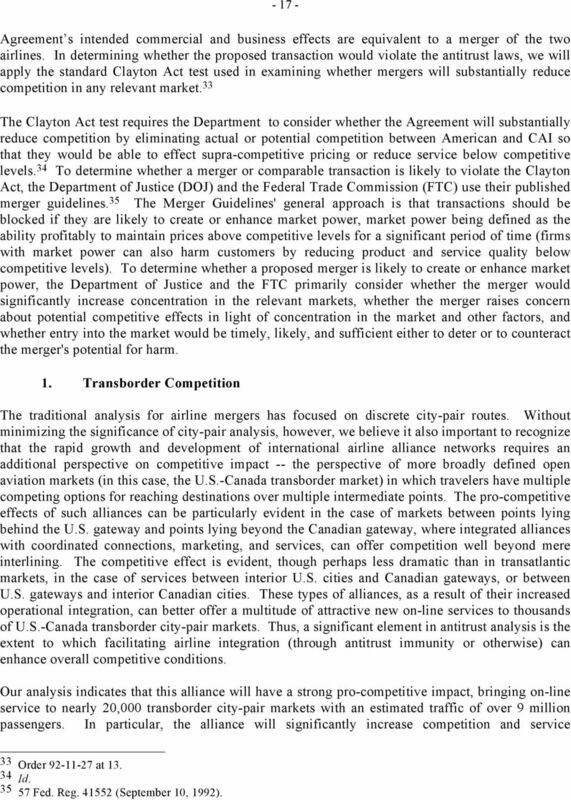 Transborder Competition The traditional analysis for airline mergers has focused on discrete city-pair routes. Without minimizing the significance of city-pair analysis, however, we believe it also important to recognize that the rapid growth and development of international airline alliance networks requires an additional perspective on competitive impact -- the perspective of more broadly defined open aviation markets (in this case, the U.S.-Canada transborder market) in which travelers have multiple competing options for reaching destinations over multiple intermediate points. The pro-competitive effects of such alliances can be particularly evident in the case of markets between points lying behind the U.S. gateway and points lying beyond the Canadian gateway, where integrated alliances with coordinated connections, marketing, and services, can offer competition well beyond mere interlining. The competitive effect is evident, though perhaps less dramatic than in transatlantic markets, in the case of services between interior U.S. cities and Canadian gateways, or between U.S. gateways and interior Canadian cities. These types of alliances, as a result of their increased operational integration, can better offer a multitude of attractive new on-line services to thousands of U.S.-Canada transborder city-pair markets. Thus, a significant element in antitrust analysis is the extent to which facilitating airline integration (through antitrust immunity or otherwise) can enhance overall competitive conditions. Our analysis indicates that this alliance will have a strong pro-competitive impact, bringing on-line service to nearly 20,000 transborder city-pair markets with an estimated traffic of over 9 million passengers. In particular, the alliance will significantly increase competition and service 33 Order at Id Fed. Reg (September 10, 1992). 18 opportunities for many of the 4 million U.S.-Canada passengers in behind-u.s. gateway and beyond-canadian gateway markets. 36 This analysis further supports our belief that these alliances will benefit consumers by increasing U.S.-Canada service options and enhancing competition between airlines, particularly for traffic to or from cities behind or beyond major gateways for transborder service. U.S. consumers and airlines should be major beneficiaries of this expansion and the associated increase in service opportunities. With this perspective, we address below the issue of airline competition at the city-pair market level. In doing so, we note that concentration figures are not conclusive. Individual airline nonstop city-pair markets usually have high levels of concentration, since most nonstop markets are served by only a few airlines. A key consideration for determining whether the American-CAI alliance (or any other airline merger or joint venture) is likely to reduce competition is potential competition, i.e., whether other airlines can enter the relevant markets in response to inadequate service or supracompetitive prices. The new aviation agreement with Canada will soon eliminate all governmental restrictions on entry into U.S.-Canada transborder markets for U.S. and Canadian airlines. The agreement will accordingly eliminate the most significant barrier to entry in those markets. The relevant considerations here, then, are whether other factors will prevent U.S. and foreign airlines from entering U.S.-Canada markets, should the applicants increase fares above, or lower service below, competitive levels. Finally, as a general rule, airlines like other firms may engage in joint ventures and cooperative arrangements without violating the antitrust laws. The courts and the enforcement agencies have usually found that such arrangements are likely to promote economic efficiency and further competition. 37 As discussed above, that has been our experience with the Northwest/KLM alliance- -the integration of those partners' operations has increased the efficiency of their operations and made it possible for the two carriers to offer improved service. The Joint Applicants primarily compete in transborder markets. The current code-share arrangements between the Joint Applicants involve nine gateway-to-gateway nonstop transborder routes, several one-stop transborder routes, and certain routes to third countries Particular Markets In addition to considerations of general transborder airline network competition (and after excluding all-cargo services, and third-country, fifth- and sixth-freedom markets), there are three relevant types of markets requiring a competitive analysis: first, the aggregate U.S.-Canada market; second, the individual city-pair markets; and last, the behind- and beyond-gateway transborder markets. 36 Combined Transborder Origin-Destination Survey (Data Bank 9), 12 months ended September See, e.g., Northwest Wholesale Stationers v. Pacific Stationery & Printing Co., 472 U.S. 284, 295 (1985). 38 American and CAI hold authority to code-share in the following markets: Chicago-Calgary/Winnipeg/Ottawa/ Toronto/Montreal; Dallas/Ft. Worth-Toronto/Montreal/Vancouver/Calgary; Miami-Toronto/Montreal; New York- Toronto/Montreal; San Jose-Vancouver; Honolulu-Vancouver; Los Angeles/San Francisco-Hong Kong; various U.S. points-taiwan; Los Angeles-Guadalajara/San Salvador/San Jose, Costa Rica; Chicago-Manchester/Birmingham, UK; Calgary/Winnipeg/Ottawa/Toronto/Montreal/Vancouver-87 interior Canadian points; and Chicago/Dallas/Ft. Worth/Miami/New York/San Jose-176 interior U.S. points. 151 FERC 61,274 UNITED STATES OF AMERICA FEDERAL ENERGY REGULATORY COMMISSION Before Commissioners: Norman C. Bay, Chairman; Philip D. Moeller, Cheryl A. LaFleur, Tony Clark, and Colette D. Honorable. Interest Rate Restrictions on Insured Depository Institutions. AGENCY: Federal Deposit Insurance Corporation (FDIC). BEFORE THE DEPARTMENT OF TRANSPORTATION WASHINGTON, D.C. ANSWER OF FRONTIER AIRLINES, INC.
Case 2:08-cv-02601-MLB-KMH Document 41 Filed 06/02/10 Page 1 of 14 IN THE UNITED STATES DISTRICT COURT FOR THE DISTRICT OF KANSAS HIMOINSA POWER SYSTEMS, INC. ) et al., ) ) Plaintiffs, ) ) v. ) Case No. DEFINITIONS ARTICLE 1: "CEA" shall refer to the Commodity Exchange Act. "CFMA" shall refer to the Commodity Futures Modernization Act of 2000. Defining relevant market(s) product (parties overlapping products and close substitutes) and geographic (local, regional, national or global?